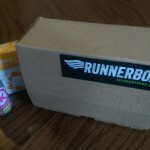 Home » Health & Fitness » Inspiration	» Amazingly Sparkly Inspiration! Don’t forget that the amazing folks over at Sparkly Soul are offering all RAD Readers a 10% discount on all orders placed through tomorrow, March 17th! Just enter the code RAD at checkout for your discount. I find my sparkle by pushing my limits and achieving things I never thought I could! Never in my wildest dreams did I think I could complete a marathon. But I did! Dead lift 210 lbs?? I did that too. Run a sub-40 minute 5K?? Yeah I totally killed that time. Krissy @ Shiawase Life: I find my sparkle by helping others with Disney and running stuff <3 And meeting new awesome friends that love both!!!! MissyMaintains: I find my sparkle by doing fitness classes that I love and feel great from afterwards. Laurie Bishop Oliveri: I find my sparkle by working out & sharing my love of disney with friends and family…even better when i combine the two! Devene Godau: I find my sparkle by surprising myself…. like when I ran the Princess Half! Allison H: I find my sparkle while running and then helping others during there run! Jen Floyd: I find my sparkle through my running and encouraging others to stay active and have fun with it!!! 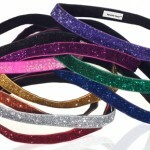 I have been wanting to try sparkly souls headband for awhile and would LOVE to win one!!!! Lynn Webb: I find my sparkle through my two beautiful little girls. They have inspired me to start running again so that I can live a long, sparkly life with them! Nicole Bynum: I find my sparkle by motivating others to run and through mine and their accomplishments in running!! Deb: I find my sparkle through my children and my husband; especially when they’re at races cheering me on (or in the stroller encouraging me to run faster, on training runs!!)! Thanks for the opportunity! Heather: I find my sparkle by challenging myself with new races! 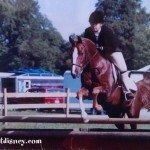 Kristen K: I find my sparkle by putting my whole heart into everything I do! I sparkle especially bright with all things Disney! Mecca: I find my sparkle every time my 3 yr old daughter is smiling and laughing, and that’s ALOT. Jillian Davis: I find my sparkle though my baby boy & my husband!! Love them and all the support they give me! Meg: I find my sparkle by running. It has given me the chance to change my previously unhealthy lifestyle, form new friends as well as nurture the one I have with my dog. It is my me time, I love it! Amy Weber: I find my sparkle by going to Disney and taking awesome photos! Katherine P: I find my sparkle through supporting others and helping others believe they can run and achieve their goals. All it takes is faith, trust, and pixie dust! Sarah: Helping others, especially with food allergies helps me find my sparkle It’s become a passion of mine for the last 4 years and has helped me personally feel my inner sparkle, which 4 years ago seemed slightly dimmed after having been diagnosed with Crohn’s & food allergies. It’s been a great way to re-channel that energy into helping others. Carrie B.: I find my sparke through running and my two beautiful boys! Heather: I did my sparky on a sun and warm day at the beach. But that doesn’t happen very often so my lil one provides the sparkly every day! Morgan Duvall: I find my sparkle when I know I’ve accomplished something that not too many other people have done… like becoming a Perfect Princess at the Princess Half Marathon this year! Jennifer: I find sparkle in my husband. He provides the motivation I need to keep going. Now, I need some literal sparkle! Jackie: I find my sparkly by setting new goals and conquering them! Cathleen King: I find my sparkle by working out and sharing my love of disney. Jessica: I find my sparkle in my daughter. She’s the light of my life. Jen A: I sparkle whenever I play with my niece and nephew.. especially when we play tangled! Amanda @SlowLaneRun: Tonight is my lazy night (shhh) and I found my motivation by watching the latest Biggest Loser! Meaghan: I find myself in accomplishing the goals I set out for myself! Love looking girlie and sparkly while doing it!! Christine @ We Run Disney: I find my sparkle with my girlfriends who know me best when I can be myself and don’t have to explain myself! Pam: I find “My Sparkle” encouraging and actually getting friends to participate in runDisney events! Next up is a neighborhood group at Wine and Dine for some girly fun! Danielle: I find my sparkle by setting goals outside my comfort zone and going for them! Wendy: I get my sparkle on every single time I fight myself to get off and away from the couch. Walking outside, breathing deeply and feeling my body in motion is my way of glittering all over the place! Julie M: I find my sparkle everytime I see progress in my fitness (new PR, weight loss, muscle definition, etc). Jessica F: I find my sparkle by challenging myself and always setting goals for myself. Lisa: I find my sparkle by racing. It feels so great to cross the finish line knowing I’ve given it my all. Hilary S: I find my sparkle in achieving new goal times and new races!! I love seeing the improvement!!! 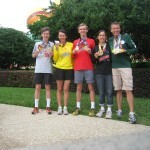 Kristen: I find my sparkle in making new friends who love to runDisney as much as I do! Paige Cofnas: I find my sparkle in achieving new milestones in physical therapy, on my road to recovery post ACL injury. My goal is to run the disney princess 2014, I missed it this year due to surgery. Kim Taylor: I find my Sparkle by going the distance! Started not being able to run a me a year ago and now I’m running half marathons! My goal is to run a full marathon in a few years. Disney and the support from others (like you!) keeps me going! Amanda Banach: I find my sparkle in my little sister Abbey, who helped me with the weekly motivation to train for the Princess Half, which we ran together just a few weeks ago. Her and I sparkled through to that finish line with our sparkly headbands, which we are now also obsessed with! Kim Smelser: I find my sparkle by staying driven and focused on my goals! I need some of those cute bands to help me out! Dominica: I’m finding that with running, I am rediscovering my sparkle. Having to leave the world of the performing arts and entering the world of wife/mother/full time teacher …I lost my shine. I lost a bit of me. But I stared working out again, and then found running, motivated by the princess half (completed my first half this year !!!) I am finding my sparkle getting brighter with every mile I run. And every race I run!!! Kinnereth: I find my sparkle with friends and family, and of course running and everything Disney!!! Sarah Grodzicki: I find my sparkle by teaching my kids new things each day. I love watchimg them learn and grow! Marcellina: I sparkle by getting my run on! I don’t sweat, I sparkle. I also sparkle when I see my 2 year old son smile at me.. nothing like the unconditional love from a little one! Ashley B.: I find my sparkle in so many things — my 8-month old son, my husband, my friends, and in all the little things in life. I stay motivated to run by continuing to sign up for fun races! Vicki: I find my sparkle by getting outdoors. A hard day at work, a stressful time in life, and it all goes away once I’ve hiked into the woods or catch my groove out on my bike. 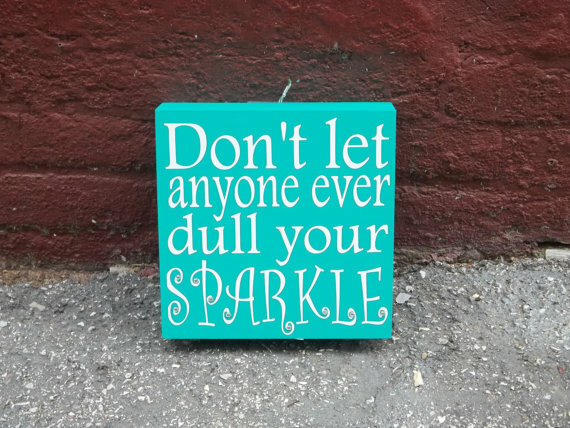 I’m extra sparkly when I can share it with my awesome family and friends. Dani: I find my sparkle through running and helping others! Laura: I find my sparkle by volunteering for races – it’s great inspiration for me to put in more miles! Steph Federer: I find my sparkle through exercise, my husband, and my 2 little girls! So if I haven’t told you all how amazing you are recently…you are!! You are strong and you can accomplish anything…ANYTHING! I’m am constantly inspired by your stories of courage, perseverance and pure will. Thank you for keeping me grounded and motivated to be better at everything I do and thank you for sharing your stories. 2 Responses to Amazingly Sparkly Inspiration! This was a fun post to read Sarah. I love seeing how other runners “sparkle”! Pam recently posted..Quintiles Half Marathon in Wilmington! Pam I’m glad you enjoyed it!